This entry was first published on September 4, 2017. No earlier editions exist. It might sound paradoxical but geography can get in the way of making a good thematic map. The basis for most thematic maps is providing the reader with a map from which comparisons are clear and discernible. This might be achieved in many ways such as through normalizing absolute values by a common denominator for a choropleth map, to take account of the inherent differences in the size of each area. Instead of changing the data and maintaining the geography, an alternative is to retain the data values but modify the geography. Consider the United States electoral system in which states with larger populations get more electoral votes. 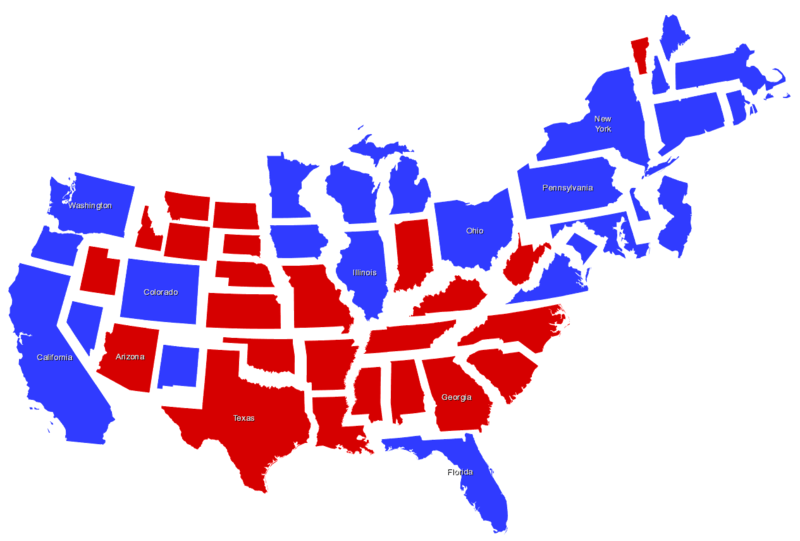 Yet, the more populous states are not necessarily the same as the largest states in area and so a map that shows the predominant result as either red or blue in the geographical sense inevitably skews our perception. We end up with an accurate, though somewhat misleading, map because densely populated states are relatively small and vice versa. People simply are not good at seeing through the mediated view of the data that the map technique delivers. While it’s possible to accommodate such issues using different design approaches for symbology, the alternative is to morph the geography itself. This is the basis for a cartogram – a diagrammatic form of map that distorts the geography to overcome some of the problems of heterogenous reality. One of the disadvantages of the cartogram is that it inevitably changes the visual representation of geography. This has consequences as the map attempts to balance statistical accuracy, geographical accuracy and topological accuracy. In some respects any cartogram could be thought of as a unique map projection – one that is modified by the data variable being mapped. As with any map projection that tries to warp 3D space onto a 2D surface, some distortion is inevitable. Cartograms therefore contain inherent distortions as they strive to minimize the natural distortions caused by our perception of real geography. The French engineer Charles Minard is largely credited as the first to use the term cartogram (Friis, 1974). Minard was a pioneer of statistical graphs and charts in the mid-1800s. He is possibly most known for the map he created to plot the catastrophic march of Napoleon’s army on Moscow but he successfully integrated graphs with maps in many other ways. Many early statistical maps were also referred to as cartograms and the term was used interchangeably with many forms of thematic map until the early 1900s. While maps and atlases had begun to use cartograms of some types, perhaps the earliest example of its use in a general English-speaking publication was in The Washington Post in 1929. Joseph R. Grundy used a cartogram to illustrate his belief that State-based voting powers were unfair as they all had markedly different populations. Hence, voting strength would also be different and the map was an attempt to show the sizes of each State on the basis of population and Federal Taxes. A 1903 publication from Germany (Kartogramm zur Reichstagswahl: zwei Wahlkarten des Deutschen Reiches in alter und neuer Darstellung mit politisch-statistischen Begleitworten und kartographischen Erläuterungen by H. Haack und H. Wiechel) pre-dates Grundy’s cartogram. It was publicly on sale at newsagents in Germany targeted at a general audience and consists of a highly detailed electoral cartogram of the general election in the German Empire at the time. In the early 1930s Raisz also noted the difficulty in accurately defining cartogram due to its use as a general term for many thematic maps. He also illustrated his text books with examples of a land-equal area cartogram. He used rectangles representing geographical divisions of the Census and States proportional to their population. These value-by-area cartograms became relatively well defined through their inclusion in textbooks by Dent (2008) and Slocum (2008). The 1990s also saw further development through the work of Danny Dorling whose abstract non-contiguous cartograms became a popular way to show data by throwing the shackles off geography altogether. Michael Gastner and Mark Newman created an algorithm that managed the two seemingly impossible objectives of warping geography by a data variable while at the same time managing to maintain shape to a reasonable degree (Gastner and Newman, 2004). Their density-equalizing contiguous cartogram technique provided a way to maintain the topological principle of adjacency while keeping some of the shape of the original unit areas. The development of cartograms since the early 2000s has progressed as improvements have been made in the various algorithms. Hennig adapted the Gastner-Newman algorithm to incorporate intra-area warping. This allowed areas to be warped in a way that caters for their heterogeneity. More recently, cartograms have appeared with increasing frequency in the mainstream media. For instance, Gridded cartograms have become popular graphical ways to report election results. They tessellate shapes, for instance squares or hexagons, of uniform size to create abstract illustrations where some other visual variable is used to symbolize the data variable itself, for instance through shading each shape much like a choropleth map. Though it is not guaranteed, many gridded cartograms are actually contiguous (adjacencies between all pairs of enumeration units are preserved). However, they are not continuous as an explicit transformation is not defined for all points (Kronenfeld, 2017). Tobler (2004) and Nusrat and Kobourov (2016) provide excellent and detailed reviews of the history of cartograms. Non-contiguous cartograms are the simplest type where the shapes of the enumeration units are simply resized according to the denominator used (Olson, 1976). Typically this results in an over-lapping or non over-lapping map (Figure 1). In a non-contiguous cartogram topology (adjacency and connectivity) is sacrificed to preserve shape and enable recognition of geographical areas. Non-contiguous cartograms are essentially proportional symbol maps where the area of each geographical unit is scaled proportionate to the data value. While the recognition of individual shapes can be maintained, position warps location and distorts the overall appearance of the map as a whole. Contiguous cartograms maintain connectivity between adjacent geographical areas but have a tendency to dramatically distort shape. Perhaps the most widely used is the Gastner-Newman cartogram (otherwise known as a population-density equalizing cartogram; Gastner & Newman, 2004) which does an excellent job of retaining some character of the general shape of individual areas (Figure 2). However, the degree of distortion often renders the map difficult to interpret due to the abandonment of familiarity. Of course, they are attention grabbing and if used in a web map, data could still be retrieved through a hover or popup which can counter the visual jarring. Graphical cartograms are a third type which effectively create proportional symbols for the data values and then reorganize them in some way. The Dorling cartogram is perhaps the most well-known, which uses proportional circles, organized to provide the best adjacency as possible (Figure 3; Dorling, 1996). An alternative is the Demers cartogram which uses squares instead of circles and thus reduces the gaps between shapes (Figure 4; Bortins et al., 2002). However, whereas the Dorling cartogram attempts to limit the distance of the eventual position of each object from its original position, the Demers sacrifices distance to maintain contiguity as far as possible. Figure 3. 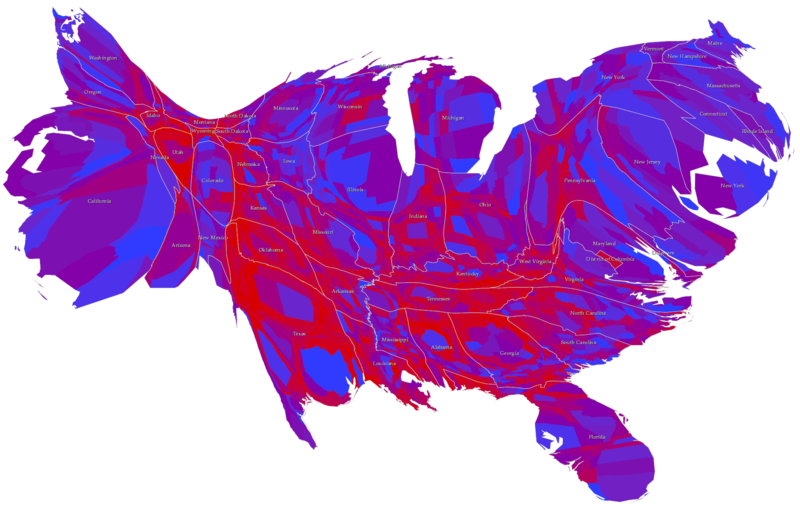 2012 U.S. Presidential election results as a Dorling cartogram. Figure 4. 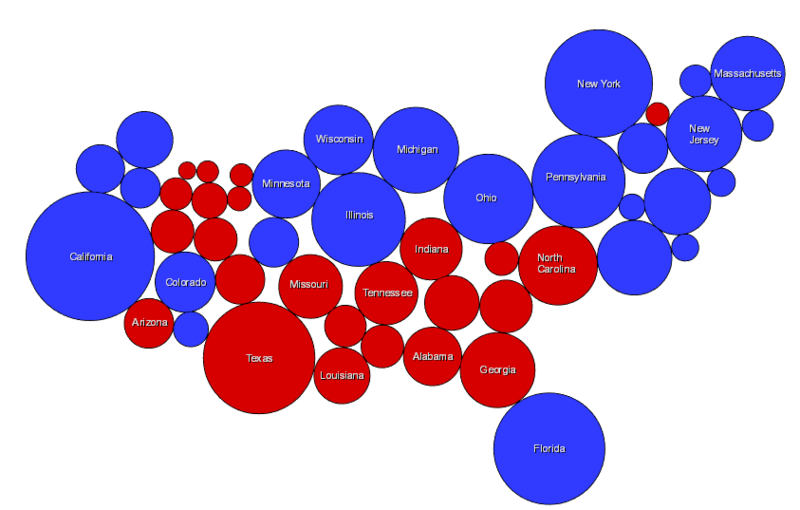 U.S. Presidential election results as a Demers cartogram. The gridded (or tessellating mosaic) cartogram is a compromise cartogram that ignores geographical shape but attempts to maintain a more uniform topology that enables people to find familiar places without the need for perfect maintenance of adjacencies (Cano et al., 2015). Squares and hexagons tend to be the preferred shape for gridded cartograms. In a gridded cartogram, each area is symbolized by the same-sized shape regardless of geographical reality. Different symbol fills can be used to show higher or lower values of the data variable being mapped, using the same processes for classification and symbolization as a choropleth map (Figures 5 and 6). Because the shapes used are uniform in size, they can also provide a framework for incorporating graphs to create gridded cartogram of small multiples (Figure 7). Figure 5. 2016 U.S. Presidential election electoral college results as a gridded hexagonal cartogram (Flanagan, 2016). Figure 6. 2016 U.S. Presidential election electoral college results as a gridded diamond-shaped cartogram (Washington Post: Gamio & Cameron, 2016). Figure 7. 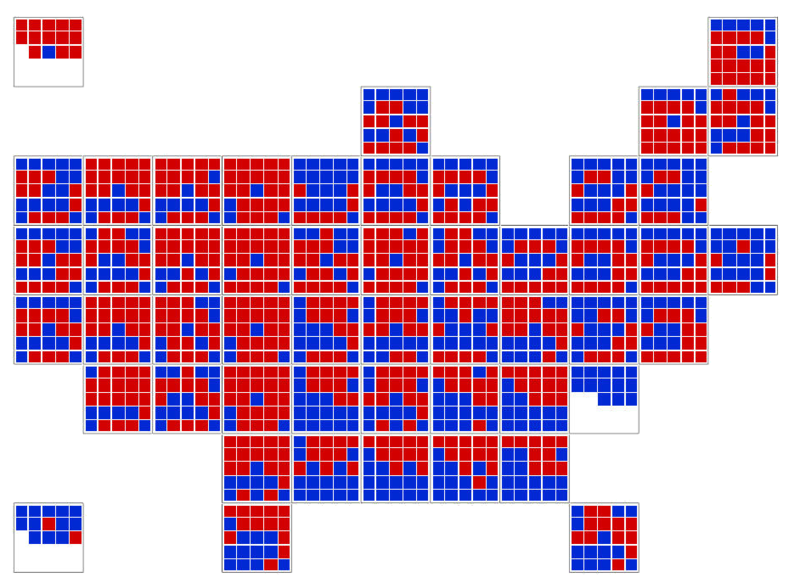 Waffle-like gridded cartogram of the Democrat / Republican share of vote by State 1916-2012. Cartograms tend to polarize opinion. They suffer criticism because they are perceived to be difficult to interpret without additional information. The same variable can make two maps of different areas look very different so the very purpose of a cartogram, to support visual comparison, can be hindered. Ensuring additional information such as recognizable boundaries or an adjacent map showing standard geography can provide some mitigation. The same problems of people’s ability to make empirical assessments from shapes of different sizes is equally true for cartograms as other map types such as proportional symbols. While not unique to cartograms, some of the more graphical variants such as Dorling, DeMers and gridded cartograms will suffer from this problem. Perhaps the most used cartograms are to grab attention and create an emotional response because of their inherent shock value. Maps that grab attention bring eyes to the content but they then have to perform the function of communicating the data variable effectively. The Gastner-Newman cartogram has often been seen as an example of being used for shock value but upon closer inspection the data is hard to interpret because the geography is sometimes warped beyond reasonable (or easy) recognition. Cultural differences in cartogram acceptance also exist. For instance, the media in the United Kingdom have long used cartograms to represent political geographies. The historical use began in the late 1990s after the publication of the Dorling cartogram. The 2015 General Election, for instance, saw virtually every print, internet and broadcast media use variations of a gridded cartogram (usually hexagonal; Field and Dorling, 2017). 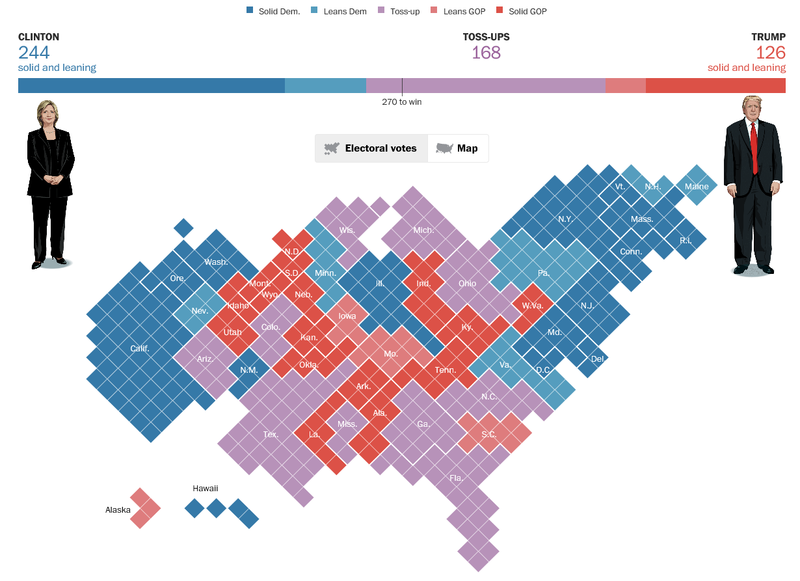 The United States media have not traditionally been large users of cartograms though The New York Times and Washington Post did make heavy use of gridded cartograms in the 2016 Presidential Election reporting. Some overarching limitations for the use of cartograms exist. Data should be at least at the ratio level so that scaling can be calculated from zero. Totals work well (as they do for proportional symbol maps). Derived data can also be used though any that use area as part of their calculation (e.g. population density) should be avoided. Negative values are not able to be mapped so data that varies around zero and has both positive and negative values must first be re-scaled. Many small data values across a large range can be problematic in creating a reasonably balanced map. One solution is to aggregate areas with small values into larger areas. Similarly outliers of very large values can create significant issues if they are to be mapped alongside many values across a small numeric value. Ultimately, a cartogram can suffer distortions like any map so the ultimate litmus test is simply to assess whether it works as a communication device. If the distortions render the map unrecognizable then it’s likely an alternative mapping technique would be more useful. Cartograms, as a form of statistical mapping, are ripe for experimentation. Multivariate versions where additional variables are represented using additional graphical techniques are possible. Cartograms traditionally show a single data variable at a time but by modifying colour or by using textures or glyphs additional variables might be incorporated. Cartograms have tended to be static but the advent of interactive computing environments that support people’s exploration of both the graphic and the data may be useful. Being able to reveal data behind a distorted area allows people to retrieve actual data and overcome some of the problems of over or under-estimation of data values by visual inspection alone. Cartograms are often produced manually, leading to arguably more appealing outcomes than those produced by algorithms (Sun & Li 2010; Reyes & Juhasz, 2015). Gridded cartograms are of course an example of this. Kronenfeld (2017) reviews many other methods of manual construction used over the years and proposes a new framework for computer-assisted construction of continuous (and contiguous) cartograms. There are an infinite number of cartograms that can be produced for a given dataset (Tobler, 2004) and the search for more appealing cartograms is ongoing. For example, there have been several algorithms developed with the explicit intent to create cartograms that look better, including Tobler (1986) and Keim et al. (2005). 3D cartograms can be generated to create a multivariate version of a cartogram (Field & Dorling, 2017). For instance, multiple variables might be stacked on top of one another and slices can be added or removed to see different map states. If temporal information is referenced to the z dimension then seeing change through different temporal cartograms can be viewed as a space-time cube. Dent, B., Torguson, J. S., & Hodler, T. W. (2008). Cartography: Thematic Map Design, 6th ed., McGraw Hill, New York. Dorling, D. (1991).The Visualization of Spatial Structure, Thesis, Department of Geography, University of Newcastle upon Tyne, UK. Dorling, D. (1996). Area Cartograms: Their Use and Creation, Concepts and Techniques in Modern Geography (CATMOG), No. 59. Friis, H. (1974). Statistical Cartography in the United States Prior to 1870 and the Role of Joseph C. G. Kennedy and the U. S. Census Office. American Cartographer, 1(2), 131-157. Gastner, M., & Newman, M. (2004). Diffusion-Based method for producing density-equalizing maps. Proc. National Academy of Sciences, 101(20), 7499-7504. Hennig, B. D. (2013). Rediscovering the World: Map Transformations of Human and Physical Space. Berlin: Springer-Verlag. Keim, D. A., North, S.C., & Panse, C. (2004). CartoDraw: A fast algorithm for generating contiguous cartograms. IEEE Transactions on Visualization and Computer Graphics, 10(1), 95-110. Nusrat, S., & Kobourov, S. (2016). The State of the Art in Cartograms, EuroVis 2016, Volume 35 (2016), number 3. Olson, J. (1976). Noncontiguous area cartogram. The Professional Geographer, 28(4), 371-380. Raisz, E. (1934). The Rectangular Statistical Cartogram. Geographical Review, 24, 292-296. Raisz, E. (1936). Rectangular Statistical Cartograms of the World. Journal of Geography, 35, 8-10. Slocum, T. (2008). Thematic Cartography and Visualization, 3rd ed. Prentice Hall, New Jersey. Tobler, W. (1961). Map transformations of Geographic Space, Ph.D.Thesis, University of Washington, Seattle (U. Microfilm #61-4011). Tobler, W. R. (1986). Pseudo-Cartograms. The American Cartographer, 13(1), 43-50. Describe the different purposes that cartograms serve in relation to other thematic mapping techniques. Compare and contrast the advantages and limitations of non-contiguous, contiguous, graphical/Demers/Dorling, and mosaic cartograms. Critique examples of different types of cartograms by their relative success at communicating information. Design a range of cartograms to suit particular needs. Given a series of different cartograms (and other thematic maps) that map the same data variable, assess the difference between their ability to communicate the data. This might be in terms of the overall message or the way in which different techniques mask certain characteristics of the data. Additionally, attention should be focused on the perceptual and cognitive dimensions of map use, seeing and interpretation. In lab ___, create a series of cartograms to reflect the data appropriately. For each of the data variables, choose a variant that you feel depicts the essential characteristics and compare the outcome to a more typical thematic map (e.g. choropleth or proportional symbol). Perform a user study to evaluate how people perceive and interpret different cartograms. For this exercise you will need to create a range of cartograms of the same data variable as well as more typical thematic map types. Your evaluation might be through the use of simple questionnaire surveys to ask how people are interpreting the maps. Alternatively, you may used observation techniques and assess metrics such as the time it takes people to respond to particular questions about each map. Worldmapper (2006) Worldmapper – mapping your world as you’ve never seen it before. Thematic mapping gallery in ArcGIS Online with examples of many different cartograms.